It was just eight years after the Nancy Drew Mystery Stories had begun its record-breaking seventy-three years and counting literary run that Warner Brothers decided to produce Nancy Drew: Detective (1938), the first of four Nancy Drew movies. Bonita Granville, who at the time was known for playing bratty kid roles, was selected for the part of Nancy Drew. 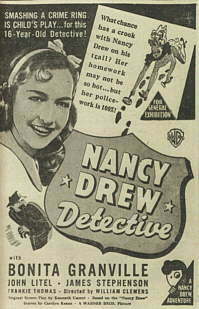 Granville must have done something right because Nancy Drew: Detective, was an immediate hit with Drew fans. Three more were made over the next year: Nancy Drew: Reporter (1939, available on VHS and DVD), Nancy Drew: Troubleshooter (1939), and Nancy Drew and the Hidden Staircase (1939). Granville did lend an air of brattiness to Nancy's character, and had her doing things Nancy would have never done in the books. The Nancy Drew of the 1930s wore sweet cotton frocks while trailing the local gangsters in her smart, low-swung roadster, complete with a rumble seat. Her father did warn her about the dangers of her sleuthing, but she didn't care. Nancy still got into more trouble than the average 16-year-old of the day. Check one of these out next time you want to sharpen your detective skills with a 1930s flair. Bonita Granville was only fifteen years old when she began filming Nancy Drew: Detective. In 1977, Nancy Drew donned her double-knit pantsuit and set out with her friends George Fayne and Ned Nickerson to solve her very first mystery on television. Millions of girls sat spell-bound in front of their television sets, anxiously waiting to see if Nancy could solve the puzzling incidents in her hometown, River Heights USA. The Nancy Drew Mysteries television show of the 1970s was saturated in cultural influences. Nancy danced to disco, drove a groovy blue sports car and even teamed up with the Hardy Boys (wearing their leisure suits) to bust crime the 70s way. Her glamourous adventures included posing as a world-famous professional tennis player, solving mysteries aboard cruise ships and overthrowing counterfeit gangs. What adventure! What romance! What intrigue! Will the Real Santa Claus..? Once during a nighttime filming of The Nancy Drew Mysteries, Jean Rasey (aka George Fayne) was blinded by bright lights and nearly drove into a lamp post. 1995, Nelvana Television produced a Nancy Drew and Hardy Boys series featuring -- of all things-- a brunette Nancy Drew (Tracy Ryan) living on her own and going to college. The series lasted only one season, and produced 13 episodes. It was shot in Paris, France, and Toronto, Canada. 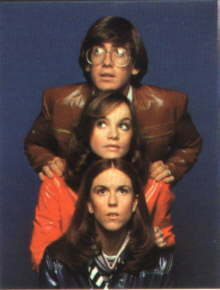 The short-lived series was broadcast in Canada, France, Germany and the United States. 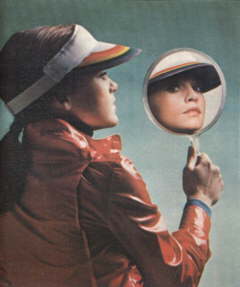 Some covers of The Nancy Drew Files featured stills from the series instead of the usual art, along with an advertisement for the new series. In France, this series was known as "Alice et les Hardy Boys"